WORK IN PROCESS . . HAITIAN ART.... ... .... NEW! 3 Realistic Pastels. This painting auctioned NOW at ebay. This lovely and delicate Pastel by well known Hawaiian artist,Sandra Ho, is outstanding by its realistic appearance. It is part of 3 hyper-realistic "Nature-Morte" representing glass bottles on a table. The transparency of the glass is so real that you feel to reach it and look through it as if the bottles were at your hands. Its size is 9" x 12". It is sold mounted under glass and the over-all size with the frame is 11" x 14". Pastel size: 9" x 12" (235m/m x 355m/m) Artist:Sandra Ho, Hawaii. This lovely and delicate art work was painted in 1995 by Garry Rochebrun Junior from Port au Prince, Haiti. Rochebrun is about 35 y.o. and a growing artist whose talent began to be recognized abroad. His works made some exhibitions in Europe and Canada. Most of his work represents naive jungle scenes with wild animals as well as country scenes. The attention to detail is his trademark. The very delicate rendering and the fullness of the colors have made his art very special. Gary Rochebrun has 3 children and all his family live in a very cramped quarter in the poorest part of the Haitian capital, Carrefour. Most of his work is made late at night by the light of a lantern, for he does not have electricity. His 'atelier' is dark and crowded by the profusion of his art. Pastel size: 9" x 12" (230m/m x 350m/m) Artist:Sandra Ho, Hawaii. This lovely and delicate art work was painted in 1995 by Jacques Lafontant. 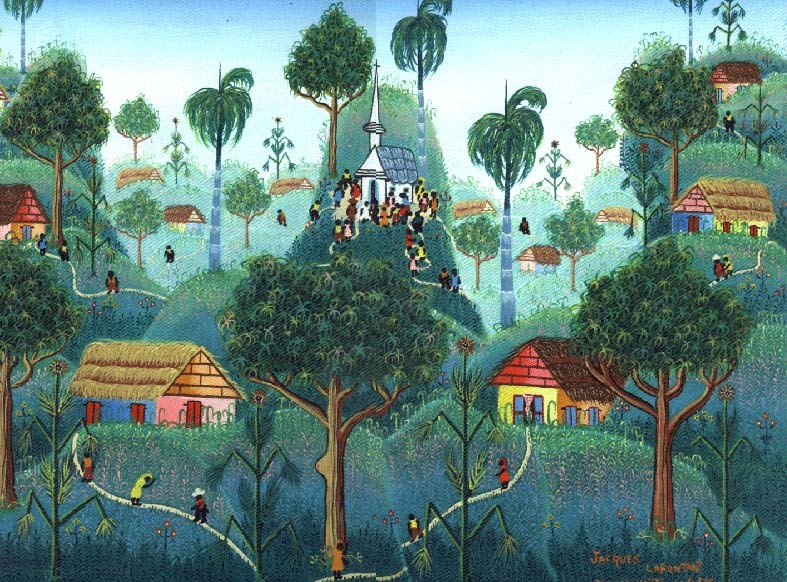 This painting is very representative of the countryside around Jacmel. canvas size: 12" x 16 1/4" (350m/m x 410m/m) Artist:Jacques Lafontant, Jacmel. This colorful art work was painted by local artist Harold St.Jean. canvas size: 9" x 12" (225m/m x 305m/m) Artist: Harold St.Jean,Jacmel. canvas size: 12" x 16 1/4" (350m/m x 410m/m) Artist: Harold St.Jean,Jacmel.